STEM (which stands for science, technology, engineering and math) is a critical need to help make students employable for 21st Century jobs; however, students do not often pursue the necessary courses for success in STEM-related careers. “The stereotype is that STEM is hard and boring,” said Dr. Carla Edge Oldham, assistant research professor in North Carolina Central University’s (NCCU) Department of Pharmaceutical Sciences. NCCU’s Biomanufacturing Research Institute and Technology Enterprise (BRITE) Program is working in schools in Eastern North Carolina to reverse that stereotype, said Oldham. “We are igniting a fire to get students excited about STEM courses and careers through hands-on activities and exposing them to jobs in scientific research at our BRITE center,” she said. 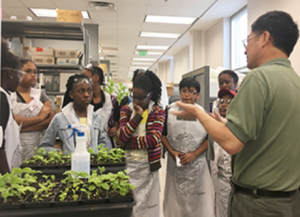 Dr. Jiaua (Jay) Xie of BRITE shares information with students from Pattillo Middle School located in Edgecombe County about his research which involves the expression of human proteins in genetically modified tobacco plants during a field trip to BRITE in Durham. Through a $185,000 Golden LEAF grant, the BRITE Program is working in Nash, Edgecombe and Martin counties to provide STEM-based opportunities for students and teachers. The University was recently honored as the “2016 HBCU of the Year” and BRITE was named the “Best STEM Program” among all 111 Historically Black Colleges and Universities (HBCU) in the nation by HBCU Digest. The Golden LEAF grant will help BRITE provide professional development for middle and high school teachers and engagement opportunities in STEM education for students as part of BRITE’s NC STEM ID program. “We also hope to create a pipeline for students to enter into STEM degree programs at local community colleges or at NCCU’s BRITE program by creating excitement around STEM in these eastern NC counties,” said Oldham. 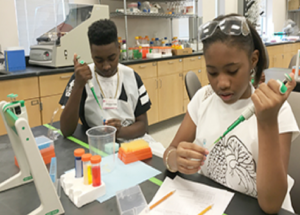 The NC STEM ID program offers several avenues for student engagement such as summer STEM camps, Saturday STEM academies, and field trips to NCCU’s BRITE campus. During a field trip to BRITE, students from Pattillo Middle School learn how to use manual pipettes while performing an engaging STEM activity. BRITE works with teachers to develop lesson plans and identify best practices in teaching science across all disciplines to enhance student engagement and learning. “The teachers participated in engaging hands-on activities that included DNA analysis and using Lil Bits to design cars,” said Amy Keith, Secondary Science Educational Specialist at Nash-Rocky Mount Schools. Keith said many teachers are planning on using the activities with their students this year. At a camp held this summer for Nash County high school students, participants worked on STEM-based projects such as solving crimes, designing cars, and learning about genetically modified organisms. Math teacher Megan Bain’s 8th grade students at Nash Central Middle School have participated in the program.